Can You Eat Celery Root Without Cooking It? 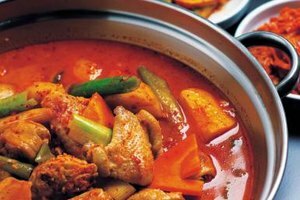 Latin-American soups and stews have boiled manioc root added to them in the last few minutes of cooking, especially spicy, tomato-based soups. 4 Can You Eat Celery Root Without Cooking It? Manioc root doesn't differ much from other starchy vegetables when it comes to cooking other than its preparation, but does best when you make the most of its texture. Although starchy like potatoes, manioc -- or cassava root or yuca, depending on where you are -- has a fibrous texture that doesn't quite go away after boiling. For something softer, you can steam-fry it, or steam then saute it in the same pan. You usually find sweet manioc root in American markets, which isn't actually sweet unless you compare it to bitter manioc root, a different variety found outside the U.S.
Slice off the tapered ends of the manioc and cut it crosswise into 3- to 4-inch-long segments using a sharp, heavy kitchen knife. Peel the thick, fibrous skin using a paring knife. Stand the manioc upright on the work surface and cut it through the center into quarters. Slice about 1/4 inch from the sharp-angled edge of each wedge -- the part that was in the center of the root -- and discard it. The part you're cutting off has a tough, woody texture and a slightly darker color than the rest of the flesh. Cut the manioc into 1/2- to 3/4-inch pieces and rinse them in a colander. Keep the sliced manioc covered with water in a bowl until you cook them. Heat few tablespoons of oil or butter in a pan on the stove over low heat. Drain the sliced manioc and add it to the pan in an even layer. Season the sliced manioc to taste with salt. Pour enough stock or water to cover the bottom of the pan, or about 1/8 inch deep. Cover the pan. Steam the sliced manioc until tender, about 20 minutes. Take the lid off the pan and set the heat to medium-high. Stir the sliced manioc frequently when the water evaporates from the pan, and fry until crispy and golden brown on all sides, about 5 minutes. Serve immediately for the best taste. Drain the manioc after cutting and rinsing it, and add it to a pot. Cover the slices with a few inches of water and add salt to taste. Boil the sliced manioc until fork tender, about 20 minutes, and drain. Add boiled manioc to stews and soups in the last 10 minutes of cooking, or mash it like a potato and add milk, butter and seasoning to taste. Keep manioc root in a cool, dry place for 2 to 3 days, or in the refrigerator for 1 to 2 days. You can also roast sliced manioc in a 350-degree-Fahrenheit oven until golden brown, about 20 minutes. Both sweet and bitter manioc root contain prussic acid, a compound that, in high doses, causes illness or death. You shouldn't come across bitter manioc in the U.S., but if it isn't identified as "sweet" manioc, check to make sure, because bitter manioc requires a special preparation technique to remove prussic acid. How Do You Eat Yucca Root?